Homemade pizza is great – it’s easy, not too expensive, you can use bits and pieces from the pantry/fridge, and it feels so darn fresh and delicious! 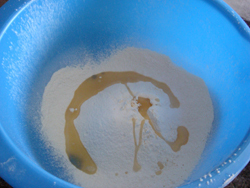 2) In a bowl mix together 200g flour, 2 tablespoons of olive oil and 1 teaspoon of salt. 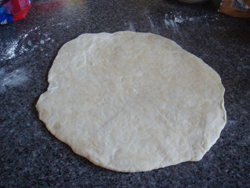 3) Slowly add water as you mix, until it all joins together into a dough, but it’s not wet or too sticky. If it does become too wet add more flour. 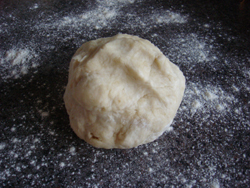 4) Put the ball down onto a floured surface. Roll into a flat layer, not too thick (I think anything under a cm is great). It doesn’t need to be perfectly round, but it should be as even in thickness as possible. 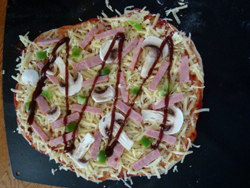 5) Pop the base on an oven tray before you start to do the toppings, otherwise it’ll be harder to move! (I sprayed mine with olive oil first, but I’m not sure it was necessary. Might use a sprinkle of flour next time. 7) Sprinkle over your toppings! 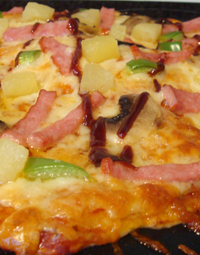 I used grated cheese (edam), sliced mushroom, green capsicum, pineapple pieces and ham with bbq sauce over all. 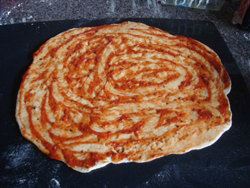 Although my pizza turned out pretty awesome, I think I might try a different recipe for the base in future. I was trying to use a recipe without yeast but I’m not sure if this was the best, it was a bit soft. Could’ve been the oil I sprayed the tray with, I guess. 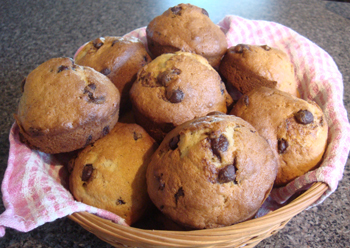 These muffins are a great way to use up old ripe bananas that you have at home, and the smell they make while cooking is one of the best things about them! Like most baking they’re best when fresh, so why not enjoy a couple soon after they’re baked – while they’re still nice and warm and melty – or pop some in a wee basket for a nice gift for Grandma! 3. 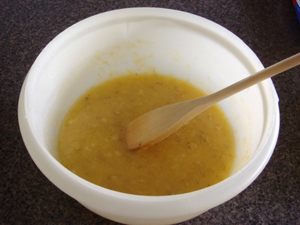 Mix in 1 egg, 3/4 cup sugar and 1/3 cup melted butter with wooden spoon. 4. 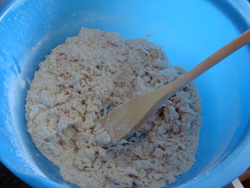 Sift in 1.5 cups flour and 1 level teaspoon of baking soda and quickly mix in. 5. 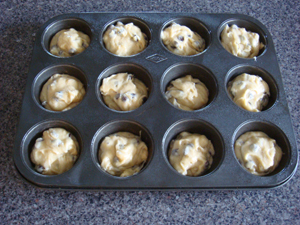 Add 1/2 cup chocolate chips and mix in. 6. 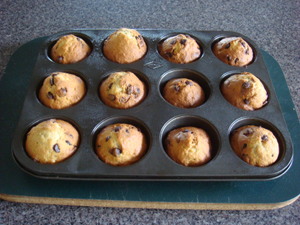 Grease a 12 cup muffin tray (I used olive oil spray) and spoon mixture into each cup until it is 2/3 full. 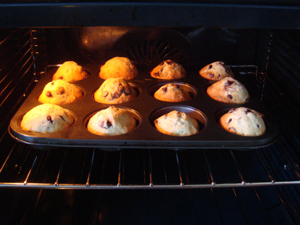 Waiting for the muffins to cool before taking them out of the tray will make them less likely to stick to the tray or break apart. I made this cake today from a recipe in the Edmonds cookbook. It was… interesting. 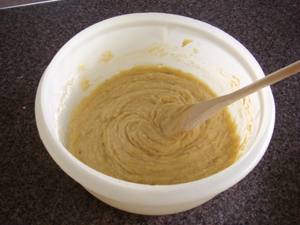 Cream 125g of butter, 125g sugar, and 1 dessertspoon of Golden syrup. 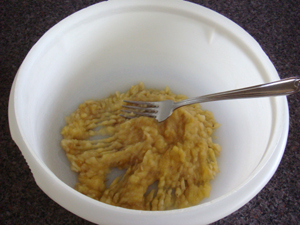 In a separate bowl mix 1/3 cup of milk with 1 tablespoon of cornflour to make a smooth paste, add 3 beaten eggs. 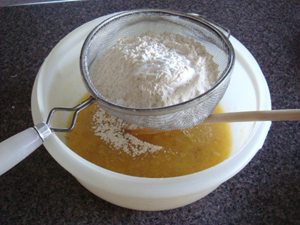 Add these wet ingredients alternatively with 225g of flour and 1 teaspoon of baking powder. Separate mixture into halves and to one half add 1 teaspoon mixed spice. 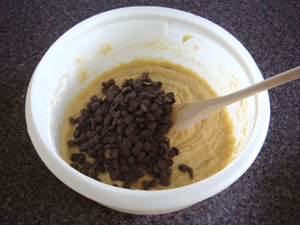 Spoon alternative spoonfuls of each mixture into a greased tin and bake for about 1 hour at 180°C. 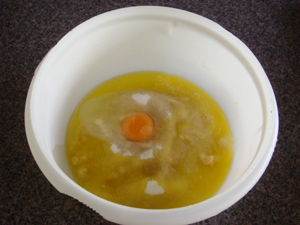 I was so angry – after starting to cream the golden syrup, sugar and butter I realised we had no eggs, so had to run out and grab some. Nuts. Smelling the cake when it came out I was really worried – the spices made it smell like carrot cake without the carrot, or even like a spicey fruit cake.